Sirsa, 14 October – Saint Dr Gurmeet Ram Rahim Singh Ji’s movie MSG The Warrior Lion heart completed it’s first week on the silver screen with a roaring collection of over 100 crore rupees. 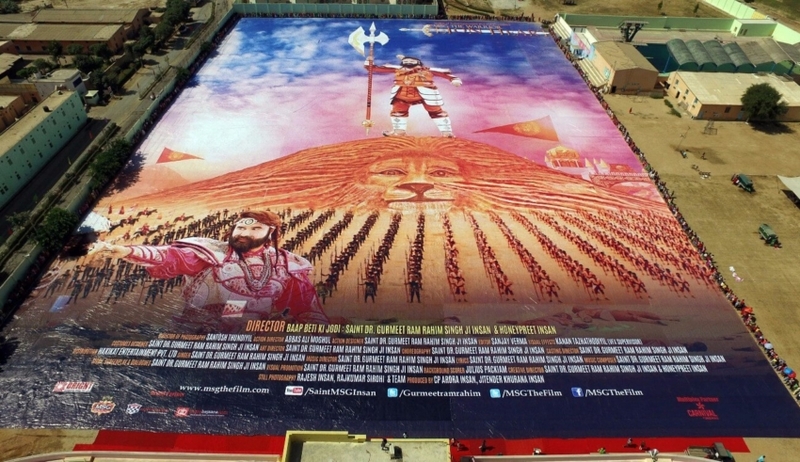 Fans are celebrating the movie’s grand success in genesis of World’s largest poster. 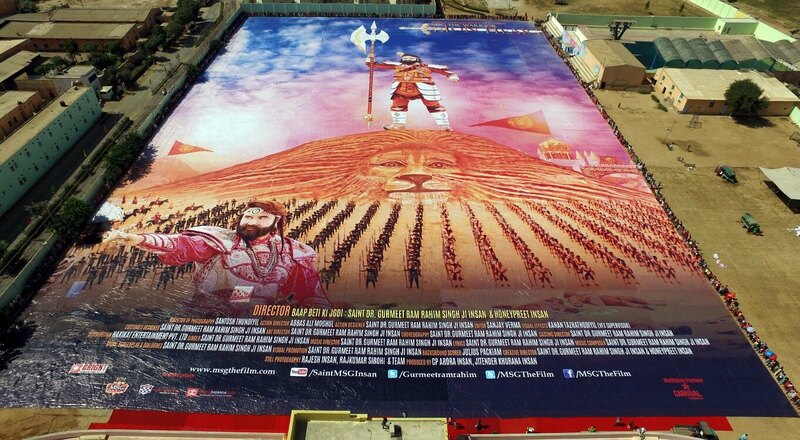 The colossal poster measuring 1 lac 62 thousand 788 sq feet took 19 hrs 50 min to make. This is Created in the Sports Village of Sirsa, India. 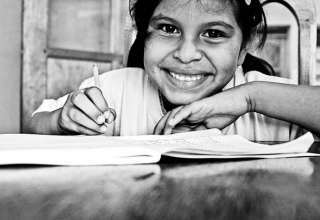 The record is all set to be dispatched to the Guinness book of world records. Prior to this, the record was held by “Generation Grundeinkommen from Genewa, Switzerland,” who crafted a 8115.32 sq feet huge poster on 13 May 2016. The phenomenal poster designed by fans of Dr. MSG portrays Saint MSG in SHERDIL Avatar atop a mountain.The excitement among fan while creating the poster was at the zenith. 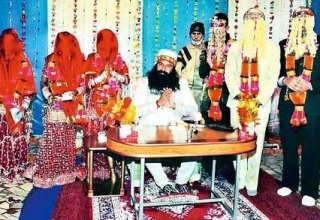 According to Pushpa Insan the event organiser, the poster was crafted as a symbol of love and joy from MSG fans to mark the success of the film within 1st week of hitting the Silver Screen. 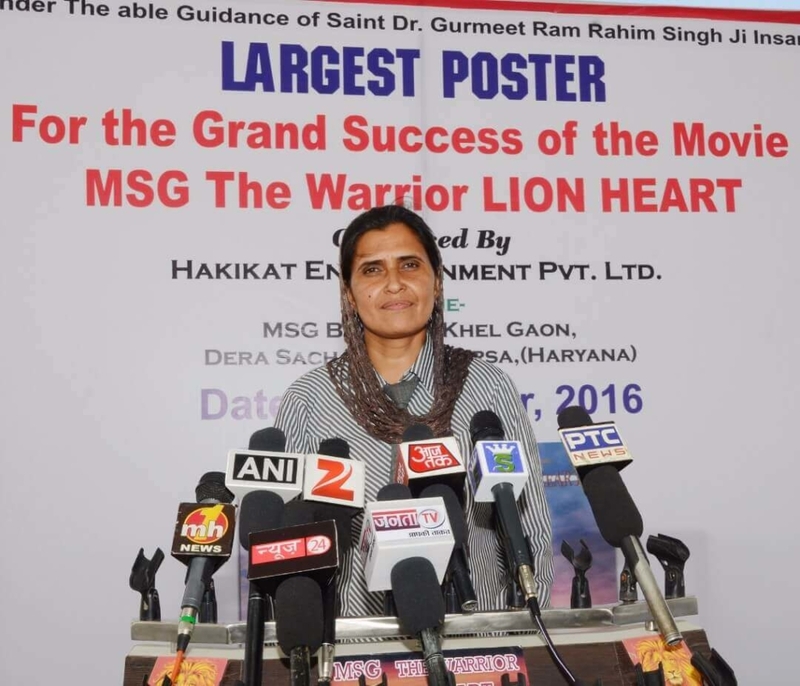 Further, she announced that this poster of the Lionheart movie is almost twice the size of the poster that held the world record from Switzerland. MSG The Warrior Lionheart has already listed one record under the Asia book of Records for simultaneous lighting of 1 lac 50 thousand earthen lamps on 23rd Sept (The same has been sent for Guinness Book of World Records as well). Moreover, the three role in front and 30 Roles behind the camera for this movie has earned Dr MSG a record in the India Book of Records. Dr MSG has been felicitated with 18 awards for his 3 films namely, MSG The Messenger, MSG-2 The Messenger and MSG The Warrior Lionheart. The first movie in the series won 3 Asia and 3 India Book of Awards. 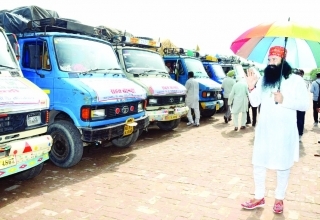 MSG-2 The Messenger has bagged 2 Guinness Book of World Records, 5 Asia Records & 3 India Book of Records. Following a similar trend ,continuing the winning spree, MSG The Warrior Lionheart has proudly earned one record each in the Asia Book of Records & the India Book of Records. 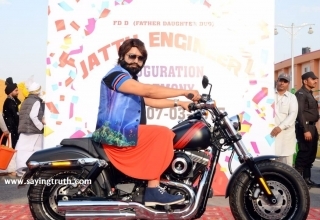 Adding another jewel to his already dazzling crown, Dr MSG was recently awarded the prestigious Dadasaheb Phalke Film Foundation Award, 2016 for His film MSG-2 The Messenger.